WASHINGTON — America’s allies in Europe are plotting ways to bypass President Donald Trump’s sanctions on Iran as they work to keep the nuclear deal alive without the United States. With a second round of U.S. sanctions set to take effect in November, European officials are working at cross-purposes with Trump’s “maximum pressure” campaign as they try to preserve as much business as possible with Iran. The goal is to persuade Iran’s leaders to stay in the deal for a few more years — perhaps long enough for Trump to be replaced and for a new U.S. president to rejoin the deal. Among the creative workarounds under discussion in Brussels and other capitals: Devising an alternative — free from U.S. influence — to the current electronic system used to transfer money from place to place, European officials told NBC News. And since commercial banks must stop handling transactions with Iran or face U.S. penalties, European countries are considering using their own central banks to transfer funds to Iran, wagering that Trump wouldn’t go so far as to sanction an ally’s central bank. The Trump administration is working to foil the Europeans, threatening to sanction anyone — from American bank executives to small foreign companies — who doesn’t comply. Caught in the middle are foreign companies that must choose between flouting the Trump administration or their own governments. A spokeswoman for the U.S. Commercial Service didn’t respond to several requests for comment. The looming sanctions have become the latest flashpoint between the Trump administration and European allies, particularly the three that brokered the nuclear deal with the Obama administration in 2015: France, Germany and the U.K. Those tensions are exacerbated by Trump’s trans-Atlantic trade battle and intermittent hostility toward NATO. “Europe can no longer rely on the United States alone for its security,” French President Emmanuel Macron said this week. To the Trump administration, the allies’ efforts constitute an egregious attempt to undermine the president’s foreign policy and ignore the threat posed by Iran’s nuclear program and other troubling activities. Brian Hook, the U.S. special representative for Iran, recently blasted the European Union for making a $21 million payment to Iran, saying it “sends the wrong message at the wrong time.” The Europeans argue the payment shows Europe’s continuing commitment to the nuclear deal. Trump administration officials have privately blamed President Barack Obama’s top aides, including former Secretary of State John Kerry and top Treasury Department officials, for what they say is an organized campaign to undercut the current U.S. foreign policy. Trump officials pointed to recent speeches, visits to Europe and op-eds by former Obama aides calling for Europe to stay in the deal, suggesting that Obama’s team is aiding foreign countries in evading sanctions. The president took aim at Kerry more publicly over the weekend, calling him “the father of the now terminated Iran deal” and noting the speculation that Kerry may run against him in 2020. “I should only be so lucky,” Trump wrote on Twitter. But some economists worry that the overuse of sanctions, particularly when other countries disagree with them, will lead the rest of the world to develop workarounds that may eventually diminish America’s economic dominance. The concern is that other economic powers like China will market themselves as attractive alternatives where international corporations can bank without being told what to do. But the sanctions include a U.S. threat to ban anyone who does business with Iran — even non-U.S. banks — from the American financial system. Because of the dominance of the U.S. banks, nearly every global transaction touches the U.S. in one way or another, even if only for a second as transactions are “cleared.” So the sanctions essentially force businesses and banks to choose between doing business with Iran or the United States. 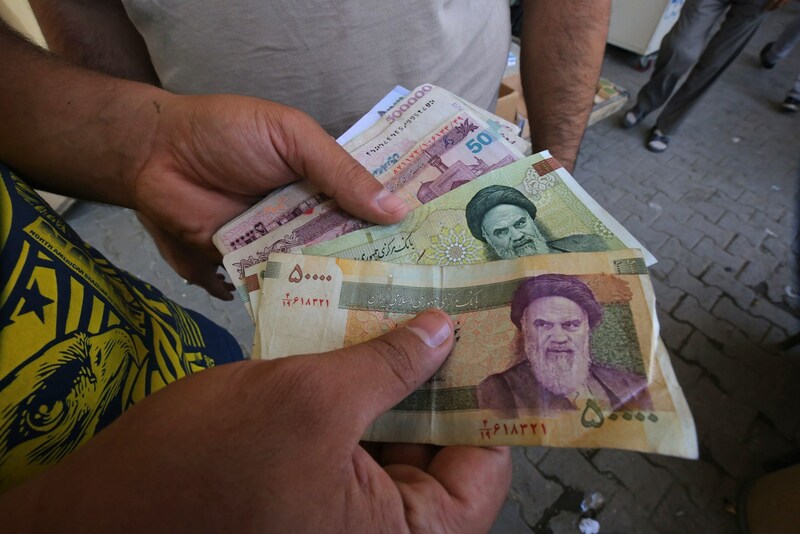 “There is clearly money to be made in Iran, but nothing like the business opportunities available in the U.S. market,” said Adam Smith, a former senior sanctions official in the Obama Administration and partner at Gibson, Dunn & Crutcher. That problem has led the Europeans to consider using their own central banks to transfer the money. Under that scheme, a central bank would collect hundreds or even thousands of planned transactions and “bundle” them together, sending the funds to Iran in one lump sum that would then be re-distributed to the intended recipients in Iran. European central banks that send money to Iran would still be violating the same sanctions as commercial banks, and could be punished. But the countries are betting that Trump won’t, given the dramatic economic implications of the U.S. slapping sanctions on the central bank of an ally. Yet Iran hawks say if any president would take that risk, it’s Trump. Another major U.S.-flashpoint is SWIFT, a financial messaging service that is used ubiquitously by banks to send money from one place to another. November’s sanctions call for Iran to be disconnected from SWIFT and say anyone who allows them to stay on the system will face sanctions. The U.K., Germany and France have all urged the U.S. to let Iran stay on the system, but Trump is expected to rebuff that request. SWIFT is based in Belgium, but its board includes top U.S. bank executives from Citigroup and J.P. Morgan, making it difficult for the messaging service to say no to Trump and risk sanctions. So European officials have been looking at creating their own “clearing mechanism” for transactions or alternative to SWIFT so transactions with Iran can continue. “I want Europe to be a sovereign continent, not a vassal,” French Finance Minister Bruno Le Maire said recently. “And that means having totally independent financing instruments that do not today exist.” The idea has stoked divisions even within European governments. After German Foreign Minister Heiko Maas advocated creating a SWIFT alternative to “protect European companies from sanctions,” German Chancellor Angela Merkel came out against it, warning it could undermine the transparency of the SWIFT system that helps root out fraud and terror financing. Other ideas the Europeans have floated have sputtered. A proposal to use the European Investment Bank to lend to European projects in Iran was shot down by the EIB’s board, which was loath to risk sanctions. The European Union this summer also revamped an arcane, little-used law known as the “Blocking Statute,” created in the 1990s to protect European businesses against the U.S. embargo on Cuba. The law prohibits European companies from complying with U.S. sanctions, and threatens to punish those who comply anyway. Those complications have led even EU officials to concede that while the blocking statute sends a powerful diplomatic message — that the EU has its companies’ backs — it is unlikely to be enforced in any meaningful way. The Europeans have also been scrambling to figure out how strictly they must comply with Trump’s sanctions requiring countries to stop importing Iranian oil. The Trump administration has given mixed messages, at first saying imports must drop to “zero” by November 5, then suggesting there could be some leniency. The law calls vaguely for “significant” reductions, which the Trump administration hasn’t specifically defined. US officials have warned Israel not to strike Iraq after officials signaled that the IDF could target Iranian military positions in the country. According to a report on Israel’s public broadcaster KANN, Washington asked Israel several weeks ago to not carry out any airstrikes in Iraq, weeks before reports surfaced that Tehran had deployed ballistic missiles capable of hitting Saudi Arabia or Israel. A report by Reuters over the weekend stated that Iran had transferred ballistic missiles to Shiite proxies in Iraq over the course of several months and that it is developing the capacity to build missile manufacturing facilities as well as train militia groups to operate the weapons. The missiles that were said to have been transferred include the Fateh-110, Zolfaqar, and Zelzal types, which have ranges of 200-700 km allowing them to be able to threaten both Saudi Arabia and Israel. Despite new US sanctions placed on Iran meant to pressure Tehran over its military activity in the Middle East and its ballistic missile program, Tehran is continuing to improve its missile arsenal. It recently unveiled a new generation of short-range Fateh missiles called the Al-Mobeen or “The Divine Conquest” which is said to have a range of 300-500 km. The Islamic Republic possesses over 1,000 short- and medium-range ballistic missiles and has the ability to proliferate weapons to countries and non-state actors such as Hezbollah on Israel’s northern border and Hamas in the Gaza Strip. Under the Joint Comprehensive Plan of Action (JCPOA or Iran deal) Tehran is prohibited from transferring any weapons to third countries but according to a new report by Fox News Iran is suspected of smuggling weapons into Lebanon for Hezbollah. Citing Western intelligence sources two Qeshm Fars Air flights took unusual routes “to try avoiding detection” from Tehran to Beirut during several flights over the course of the past two months. According to intelligence sources quoted by Fox, one flight on July 9th stopped in Damascus before flying over “rather uncharacteristic flight path” over northern Lebanon and carried components for producing precision weapons. A second flight on August 2 “took a slightly irregular route” flying over northern Syria. The report did not say what the cargo of that flight was. “The Iranians are trying to come up with new ways and routes to smuggle weapons from Iran to its allies in the Middle East, testing and defying the West’s abilities to track them down,” said an intelligence official quoted by Fox News. Israel has reiterated its view several times on any transfer of advanced weaponry to Hezbollah as a “red line” and will work to prevent any such movement. Israel is also concerned that Iran is not only trying to consolidate its grip in Syria where it could establish a forward base to attack Israel, but that it is trying to build an advanced weapons factories in Syria and Lebanon in order to manufacture GPS-guided missiles that could hit targets with greater accuracy. On Monday the head of the IDF’s Northern Command Maj.-Gen. Yoel Strick warned that Israel’s military has dramatically improved since the last conflict with Hezbollah in 2006. 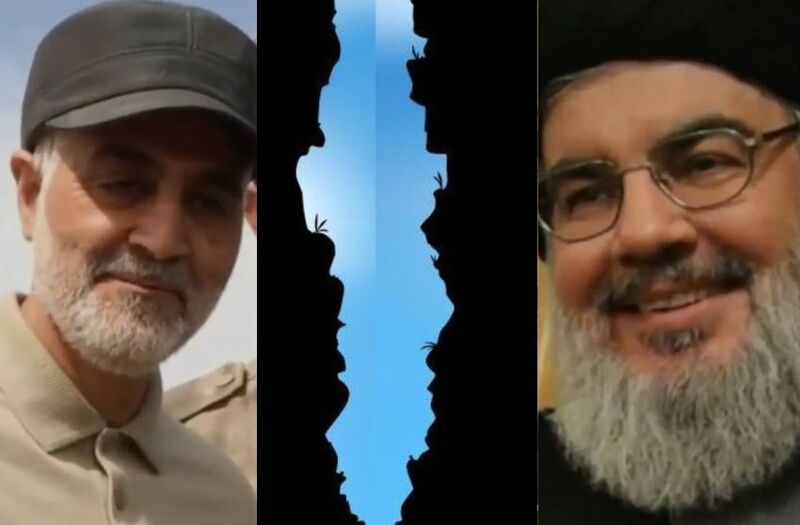 Exclusive: After long service to Shiite Iran’s expansionist goals, Hizballah’s Hassan Nasrallah’s close ties with Gen. Soleimani are on the rocks, after he strongly disparaged the general’s tactics in Syria, DEBKAfile’s military and intelligence sources reveal. The sudden breach between Iran’s most dedicated surrogate and his boss, commander of Iran’s military operations in the Middle East, has taken the Shiite world by storm. It has also thrown other Shiite militias fighting under Soleimani’s command in Syria in disarray. Without a word to the Iranian general, he pulled back home to Lebanon roughly 5,000 Hizballah troops from the Syrian warfront, depriving Soleimani of more than half of the competent fighting strength at his disposal in Syria. The Pakistani and Iraqi militia fighters never measured up to Hizballah’s combat standards. Nasrallah has ignored Soleimani’s orders to send back to Syria at least half of the Hizballah force he sent home. The Iranian general turned to pulling strings in Tehran with Revolutionary Guards and regime high-ups. They tried to cajole Nasrallah into relenting by arguing that, after leading so many critical battles in the Syrian war, he must not quit when the final campaign was at hand in Idlib. Nasrallah still refused to toe the Iranian line. In closed-door meetings with senior Hizballah officials and commanders last month, Nasrallah is reported by our sources to have laid out a string of complaints against Soleimani’s tactics in Syria. He faulted the general’s decision to scatter a large number of IRGC Al Qods and Shiite militia bases across the country, asserting that massive US-Israeli air power would soon reduce them to dust. He also grumbled about the inferior quality of the Shiite militias on which Soleimani depends and said they were unreliable in combat. Since the Nasrallah-Soleimani rupture, those militia chiefs have vented their own beefs, primarily about their treatment at the hands of the Iranian general who issues diktats and expects unquestioning obedience as his only form of communication. Some are now going behind the Iranian commander’s back and addressing their messages to Nasrallah in Beirut for passing on to Tehran. The fractured ties between Iran’s top surrogate chief and its senior Middle East strategist surfaced in the past fortnight when Iran’s defense minister Amir Hatami and foreign minister Muhammed Javad Zarif, who paid important visits to Damascus, skipped side trips to Beirut and contacts with Hizballah leaders. Our military sources also disclose that the withdrawal of Hizballah troops from most of eastern Syria to Lebanon was the catalyst for violent battles over territory between Soleimani’s Shiite militias and Syrian contingents, mainly in the Deir ez-Zour and Abu Kamal regions. In the fighting which broke out on Aug. 8 – and is still ongoing – both sides are using artillery, mortars, heavy machine guns and automatic sidearms. Both have inevitably suffered substantial dead and wounded casualties. In an attempt to curb the unfolding catastrophe, the Russian high command in Syria acted in the second half of August by posting Russian military police on the Euphrates River bridges to try and separate the warring forces in the two embattled areas. Those same military police were originally assigned to man 8 positions on the Syrian-Israeli border opposite the Golan. Millions of Palestinian refugees “cannot simply be wished away,” the head of a U.N. support agency said on Monday, hitting back at a U.S. aid cutoff and allegations the agency’s perpetuates the Palestinian plight rather than helping them. The United Nations Relief and Works Agency provides services to some 5.3 million Palestinian refugees across Jordan, Lebanon, Syria and the West Bank and the Gaza Strip. Most are descendants of some 700,000 Palestinians who were displaced during and after the 1948 war that led to Israel’s establishment. U.S. ‎State Department data disputes UNRWA’s count, saying that there are currently only about 20,000 ‎Palestinian refugees worldwide. The exaggerated refugee count was cited by Washington, UNRWA’s biggest donor, in its decision last week to withhold funding, and has potential ramifications for the Palestinians’ pursuit of a right of return to land now in Israel. Successive Israeli governments have ruled out such an influx of Palestinian refugees, fearing the country would lose its Jewish majority. “I express deep regret and disappointment at the nature of the U.S. decision,” UNRWA Director Pierre Krahenbuhl said in an open letter to Palestinian refugees and the agency’s staff, in which he pledged the agency’s operations would continue. But Krahenbuhl said, “The protracted nature of the Palestine refugee crisis” was not unique. He said the children and grandchildren of long-displaced refugees in Afghanistan, Sudan, Somalia, Congo and elsewhere are also recognized as refugees and assisted by the United Nations. “No matter how often attempts are made to minimize or delegitimize the individual and collective experiences of Palestine refugees, the undeniable fact remains that they have rights under international law and represent a community of 5.3 million men, women and children who cannot simply be wished away,” he said. Ramallah official: Article penned by Middle East envoy Jason Greenblatt proved the U.S. administration’s pro-Israel bias and total rejection of Palestinians’ legitimate demands • In article, Greenblatt accused PA leaders of harming the Palestinian people. Palestinian Authority President Mahmoud Abbas is demanding that U.S. special envoy to the Middle East Jason Greenblatt be replaced as peace mediator because of his bias in favor of Israel, a senior PA official and close associate of Abbas told Israel Hayom. The official said that Abbas was demanding Greenblatt’s ouster before he would agree to resume the peace process, aimed at resolving the decades-long conflict between Israel and the Palestinians. “What appeared impossible only a few years ago is now possible,” Greenblatt wrote, adding that a peace deal depended on willingness by both the Israelis and Palestinians to make difficult decisions for a lasting peace. Greenblatt said that as of print time, the Palestinian leadership was “refusing to cooperate,” and called the Palestinian recalcitrance “disappointing.” He also accused the Palestinian leadership of harming the Palestinian people. “Greenblatt’s piece in Israel Hayom clarifies the biased stance of the U.S. administration and Greenblatt himself in favor of Israel, and total rejection of the Palestinians’ legitimate demands,” the official told the paper on Monday. The official, like other PA administration figures in Ramallah, said that Abbas has recently been in secret contact with the Trump administration about the framework in which the Palestinians might return to the negotiating table and withdraw their boycott of the American administration. One of the Palestinians’ main demands is that Greenblatt be replaced by an “objective” go-between, the official said. Another Abbas associate told Israel Hayom that a delegation of American defense officials had recently arrived in the West Bank and held a series of meetings with senior PA officials. In addition, the official said, Abbas has recently dispatched a PA delegation to Washington, which echoed the demand to replace Greenblatt. “Despite Greenblatt’s attempt to present the position of the [Trump] administration and himself as a fair and objective mediator, we aren’t buying it. This is nothing but hypocrisy,” the official said. Iran has been smuggling weapons to Hezbollah on Qeshm ‎Fars Air flights from Tehran to Beirut over ‎the past two months, Fox News reports • Airline believed to be a shell company established to avoid detection, challenge Western intelligence agencies. Western intelligence officials believe Qeshm ‎Fars ‎flights carried materials necessary to produce ‎precision weapons in Iranian factories inside ‎Lebanon. Fox noted that Qeshm Fars Air is believed to be one ‎of the “various pseudo-civilian airlines used for ‎arms-smuggling” by the Revolutionary Guards and its ‎elite black-ops arm, the Quds Force. 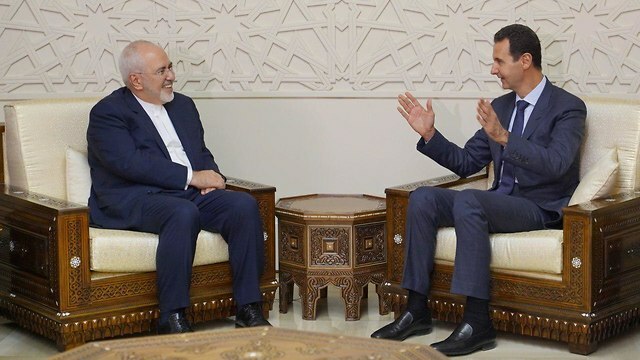 Syria’s President Bashar Assad and Iranian Foreign Minister Mohammad Javad Zarif met on Monday to discuss recent developments in Syria and the region, and prepare for the upcoming summit with Russia, Iran and Turkey. “the pressures exerted by some Western countries will not deter both countries from continuing to maintain their principles and securing the region,” the statement read.During the meeting, the two leaders discussed recent developments in Syria and the region, as well as issues on the agenda in the summit between Russia, Iran and Turkey, which will be held in Iran in the coming days. The Syrian government’s forces are planning a phased offensive in Idlib and surrounding areas held by insurgents fighting Assad, who has been backed by both Russian and Iranian forces. 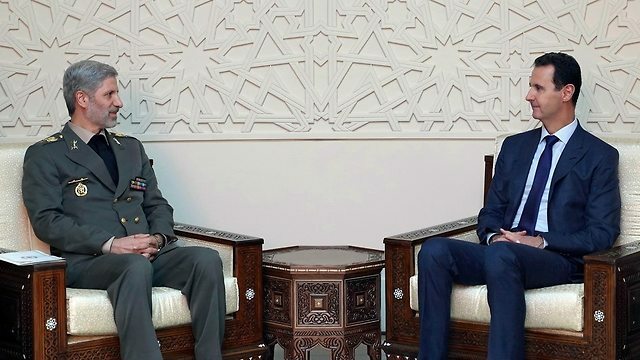 This is a second visit of an Iranian official in Syria this past week.Iranian Defense Minister Amir Khatami arrived in Damascus a week ago for a two-day visit, during which he also met with President Assad. During his visit, Khatami signed a military cooperation deal with his Syrian counterpart Ali Abdullah Ayoub. 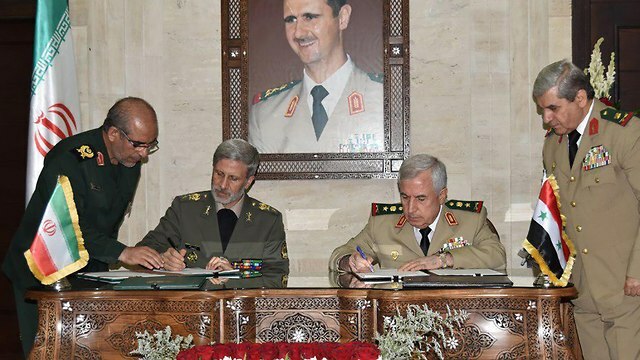 Regarding the military cooperation between the two countries, the Syrian defense minister said that the presence of “Iranian advisors” in Syria is the result of as an official request made by the Syrian government, in agreement with Iran. Iran’s official position is that these advisers will remain in Syria as long as Syria sees fit.Sputnik reported that a senior Syrian official claimed that Khatami’s visit dealt with rehabilitating Syria following the war, but was also meant to convey the message that the Iranian military advisers and the Syrian army tightened their relations. According to the source, the visit is a response to the Israeli and American demand that Iran withdraw from Syria.